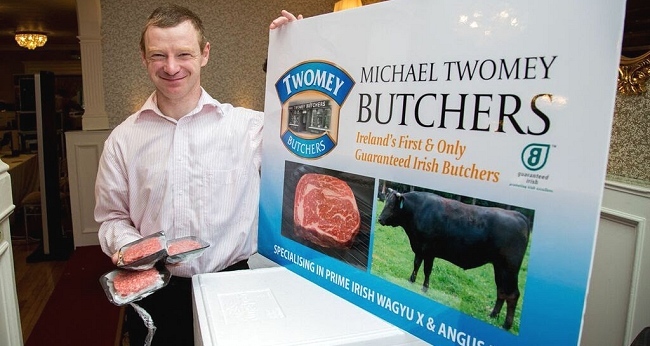 Michael Twomey Butchers opened in September 1996, in the town of Macroom, Co. Cork; supplying the highest quality, specially selected local fresh Irish Beef, Pork, Lamb, Poultry, Wild Irish Game and Bacon to our customers. We aim to deliver, at all times, only the very finest quality meats, value for money, and excellent service to our valued customers. 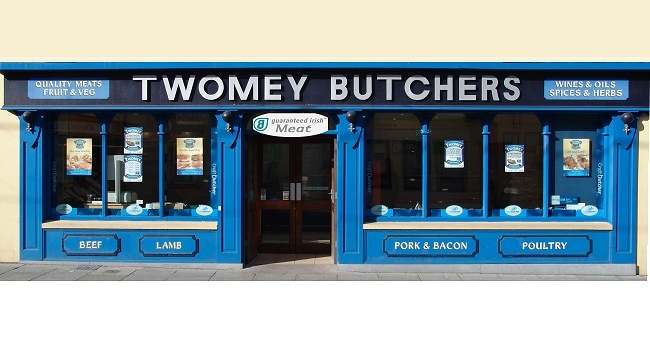 Twomey’s are traditional Irish butcher shops, working hand-in-hand with local Irish farmers to produce top quality beef, lamb, pork, low salt home cured bacon, poultry, hand made sausages & burgers. We also offer bespoke cuts, designed for parties, BBQ’s, and special occasions. 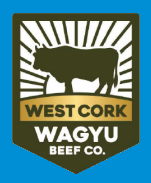 All our beef is Irish Angus or Hereford, reared in the traditional way in West Cork, supporting our local rural farming community. We are the only Guaranteed Irish™ accredited butcher in Ireland. All our meat is 100% Irish. Approx 80% of our meat comes from within a 20-mile radius of Macroom Town, with the remaining 20% hailing from East and West Cork predominantly. We always strive to source our meat locally, in an effort to support local agriculture and the local economy. 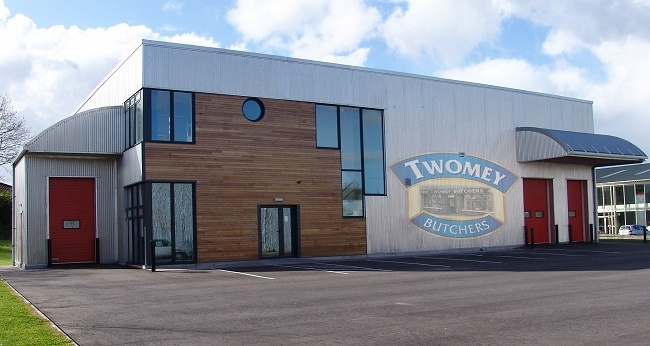 Michael Twomey Butchers has its own Meat Processing Plant; opened in 2007, further guaranteeing that skilled artisan butchers, assuring superb standards, undertake the quality, handling and processing of the meat. In 2010, we expanded the business, by opening a new store in Bantry, West Cork, followed in 2016, by a third store (with deli) in Bandon, West Cork. Our highly skilled artisan butchers and catering staff (numbering forty-two) assist in the smooth running of the business. We also supply our top quality meats to other artisan butcher shops, cafés, bars, restaurants and hotels all over the country, and abroad. All our meat is fully traceable; from “Farm to Fork”. Full tracability is displayed at all times in all of our shops. We are one of the first food companies in Ireland awarded the “Ecolabel” accreditation for our commitment to positive environmental policies and a low carbon footprint. We now offer our top quality Irish meat online delivered direct to your door. Click into a meat category to view our extensive range of products. We update and add new products to our online shop regularly. The meat is delivered fresh (not frozen; unless requested) to your door, packaged and labelled as per your requirements. We can deliver all over the island of Ireland.